Driven by a strong sense of urgency, he thrives on massive change under fire. His calm spirit and demeanor brings peace and harmony to chaos and uncertainty. Resourceful, entrepreneurial and innovative, he always searches out new ways to improve business operations and elevate best-practices. Geoff inherited his get-your-hands-dirty work ethic from his father who was an hourly factory worker at General Motors for 31 years. His father said to him early in his career, “Never walk into a new environment with your fancy suits acting like your better than anyone. Put your blue jeans on, roll up your sleeves and get dirty with the front-line employees; the people whose buy-in and respect you will need if you ever want to be successful.” Geoff has humbly lived by this motto. Often pulling the team and pushing only when necessary, his leadership style reflects his genuine care for others, but more importantly in delivering incredible results. ► As Director of Operations at Rose Tarlow Melrose House, hired to implement lean methodologies and turn around a weak culture, he reduced lead times by 23% and increased on-time performance by 82%, while increasing quality by 18%. ► As Chief Operations Officer at BambooBuddy, he led a start-up to a multi-$million business, earning A-level grades from its largest customer Lowes Home Improvement stores for on-time delivery, fill rates, inventory turns and sales. ► As Vice President of Strategic Operations at Dark Horse Distribution, hired to lead a crisis turnaround, he turned the company in the black by identifying new marketing channels, generating new products, revitalizing old brands and completely transforming the culture. 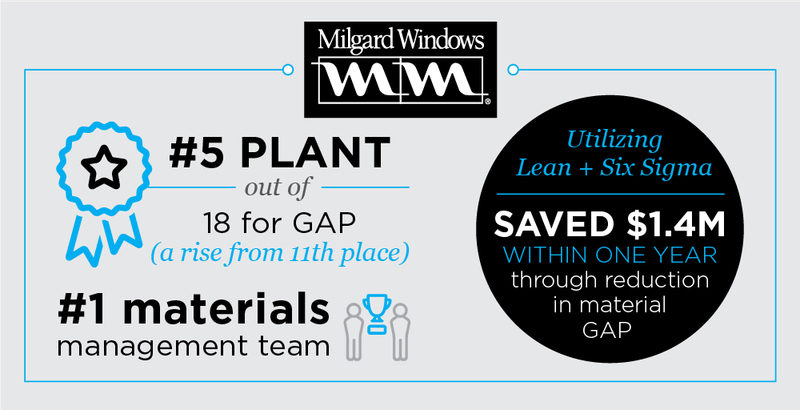 ► As Materials Manager at Milgard Manufacturing, he initiated lean methodologies to the company leading their continuous improvement efforts, resulting in a savings of $1.4M through 1 project alone reducing the material waste, earning #1 materials team among 17 plants, and positioning his $120M plant in the top 5 overall. ► As Operations Manager at General Motors, he led his team in a tough union environment to earning the #1 AC/Delco facility in N. America for 4 straight years and earning a top 5 position among 28 service parts operations plants, based on 25 corporate metrics. His toyota-based lean training led to his team championing over $10M in savings. With a Masters in Business Administration from Pepperdine University and a Bachelor’s in Chemistry from Michigan State University, Geoff’s educational foundation is rock solid. His yearning to always be on top of his game has led him to also earn multiple certificates in lean, six sigma, as well as a pending certificate in project management (PMP). In addition, he has been coached by Brendon Burchard, as part of the Achievement Accelerator program and High Performance Academy. His passions away from work include reading, playing guitar, meditation, traveling, and spending time with family and friends. He and his wife Cathy, a Presidential Club award winner in the telecom industry, have two beautiful children: Giana and Liam. They live outside of Los Angeles, California. Geoff earned a B.S. 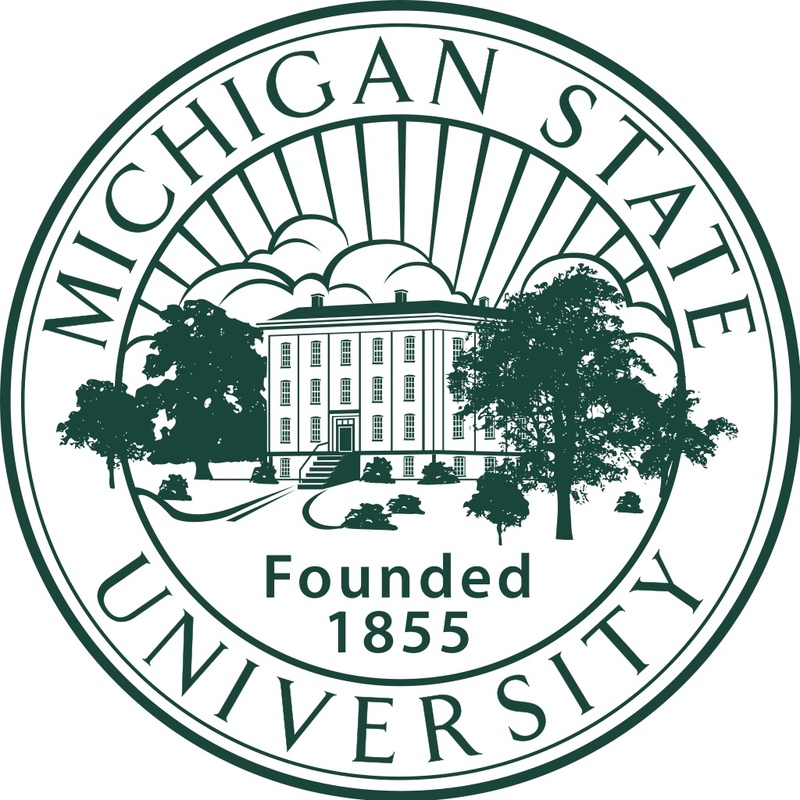 in Chemistry from Michigan State University and a MBA from the prestigious Graziadio school of business at Pepperdine University. 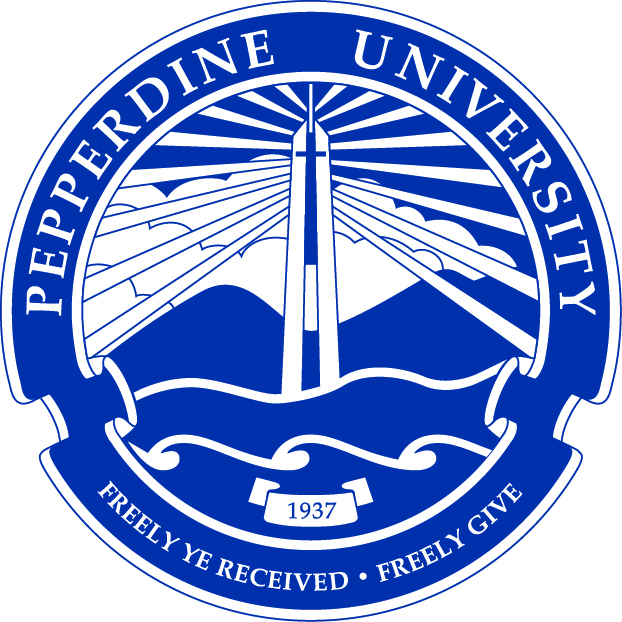 He is an honoree of Pepperdine’s 40-over-40 campaign, being chosen out of 497 distinguished alumni. A life-long learner, he continues to earn certificates in various disciplines, as well as reads 1 book per week. He is an active member of Project Management Institute (PMI), Institute of Industrial Engineers (IIE) and American Society of Quality (ASQ). Challenged to reinvent the customer experience / service model for our agents/contractors/clients to grow architectural sales; 12% gain in zone revenues FY17, 4% gain in 2018. Fully engaged with Product Support, Engineering, Product Development, Design, Customer Experience, Warranty, Sales, etc. – it’s all a part of our “value” chain. 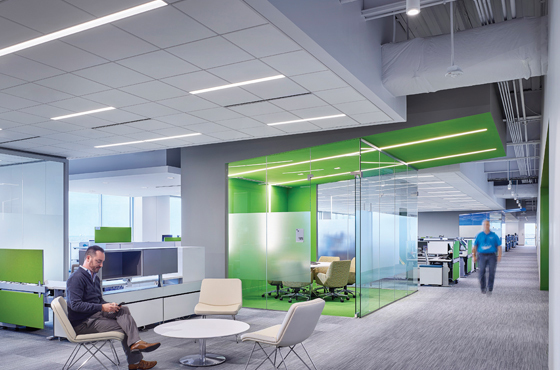 Acuity Brands is a $3.7 Billion provider of lighting and energy management solutions (IoT, smart city, led). Led multi-phased, $multi-million projects, cradle to grave. Managed 25+ projects for 3 agencies from Ventura to San Diego to Vegas, as well as supported 7 sales reps from Western Canada to Colorado to Phoenix. Applied lean methodology to institute and organize 30 standards of work for the project management team of 20. Participated in tech support kaizen, resulting in a reduction of escalations. Reported to Director of Design & Application Services, reporting to V.P. Customer Experience. Contracted by CEO to manage multiple projects including systems integration, supply chain and logistics for this luxury company introducing a high-tech meditation pod to the health and wellness industry. Developed overarching global strategy and infrastructure with CEO and IT architect including user experience, product life cycle phase analysis, market penetration, and systems integration. Instituted lean systems and processes for managing the supply chain; negotiating contracts with vendors; ensuring just-in-time delivery; assurance of inventory control. Collaborated with engineering and product development to build a robust, high-quality product, troubleshooting and training manuals and videos, and a quality control system. Created a dashboard and database that integrates all systems and departments seamlessly. Streamlined communication via Confluence + Dropbox + Trello + Slack. Contracted by CEO to implement lean systems and operations for this new luxury furniture company. Implemented lean processes including development of 20+ new standards of work; 6S, value steam mapping, DMAIC. Developed a 5-part metric system and continuous improvement board with 60+ actionable items. Instituted a detailed management performance system for employee development improving efficiency by 33%. Created a production schedule board for vendor management resulting in improvement of on-time performance from 20% to 65%, while increasing first-time quality by over 14%. Led IT project setting up new systems with All Orders, QuickBooks, and Salesforce. 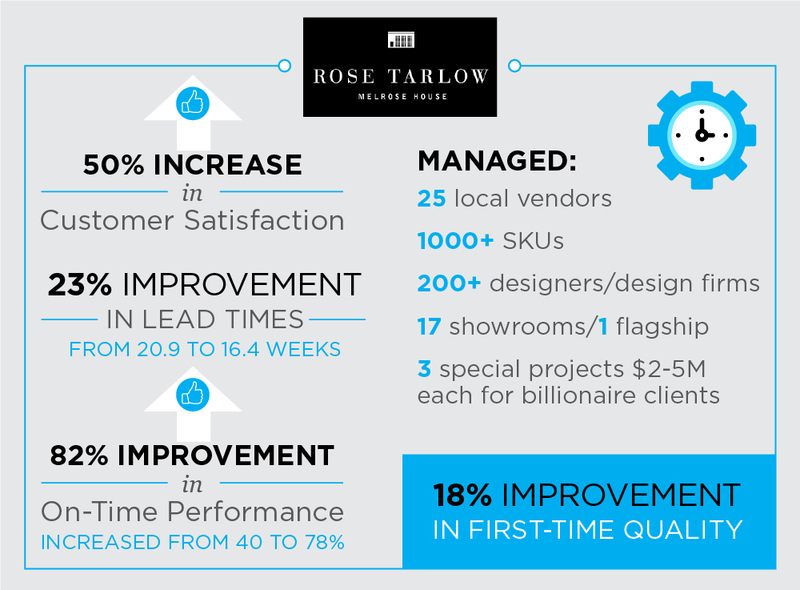 Rose Tarlow Melrose House, Inc. West Hollywood, CA – Director of Operations 01/2014 – 02/2015 In charge of all operations for this luxury, high-end company serving the interior design community. Products include furniture, textiles, lighting, rugs and accessories. Led management staff of 16 including Production, Purchasing, Customer Experience, Warehouse, Quality, Logistics, and Special Projects. $2.2M budget. Results: reduced lead times from 20.9 weeks to 16.4 weeks. Improved on-time performance from 40% to 78%, while simultaneously reducing the lead-time from 20.9 to 16.4 weeks. Drove new levels of first-time quality after overhauling the entire quality process contributing to an 18% improvement. Utilized lean tools to drive continuous improvements resulting in 45 new standards of work written, identifying top 3 customer needs, eliminating low selling skus, reduced shipping errors by 10%, and increased customer satisfaction by 50%. Transformed the culture positively with management performance system, 360 reviews and CXPA training. Member of Customer Experience Professional Association. Launched 35 new products, partnered with Cox London to release 60 new products, launching new finished sample program. 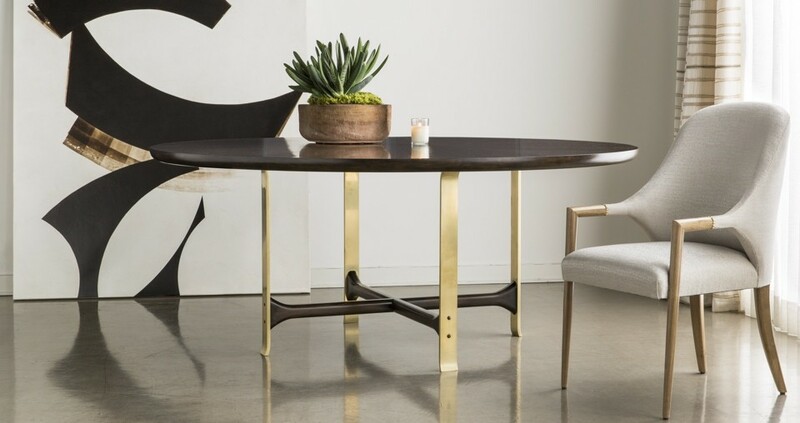 Managed the relationship with 25 local vendors producing 150+ sales orders per month, 1000+ skus, while working with 200+ designers, design firms, and 17 partner showrooms, as well as our flagship store in LA. 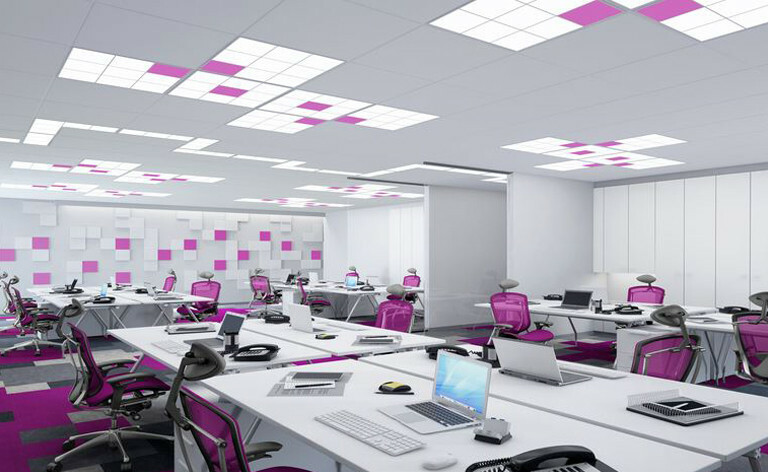 Navigated 3 highly-customized projects in the $2-5M range for high-profile billionaire clients. Geoff is one of the strongest operations leaders I have had the pleasure of working with. He was brand new to our industry when he joined Rose Tarlow Melrose House. He developed an understanding of the business very quickly. He listened and absorbed; never jumping in with suggestions or plans until he had a full understanding of the situation. He was meticulous at putting in place systems and metrics, and also developed a high level of accountability and ownership with his team. He was an amazing leader. He stepped into a very difficult situation with legacy employees who didn’t want to change and basically no systems in place. He lead by example; pulling the team along first, and pushing only when he had too. He then created his own systems using any resources he could pull together. And the results spoke for themselves. We saw massive improvements in on-time %, first time quality and customer satisfaction. I recommend Geoff highly. Any organization will be lucky to have him leading their team. 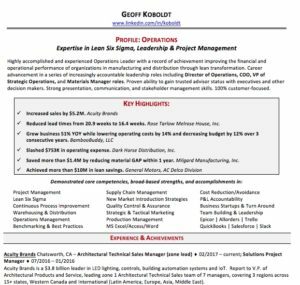 Geoff is a strong lean operations leader with a focus on continuous improvement. I have seen his key skills revolve around optimizing process and documentation. He also has experience with management performance evaluation systems and is adept at implementing the framework. Geoff would be a valuable member of teams looking for these key skills. I had great success working with Geoff at Rose Tarlow Melrose House. Geoff’s fostering innovation helped me develop better, faster ways to do things. He takes the lead in setting new business directions, procedures and policies. Under his management, he helps me develop a clear understanding of what I will need to do differently as s result of changes in the organization. I admire his confidence to allow me the freedom to decide how I will accomplish our goals and resolve issues. I highly recommended Geoff for his leadership and his ability to empower employees. You don’t ever forget leaders like Geoff Koboldt. Geoff is the poster child of delivering value and quality to customers. His ability to inspire others to get down to the roots of problems and fix them is exceptional and beyond expectations. His unique management performance system identifies where each employee’s strengths and weaknesses are so every employee knows exactly where to focus their energy as he quickly guides them from goodness to greatness. There is no doubt that he cares for each employee as if they were his own family. His level of emotional intelligence (EQ) is unmatched and when combined with his business intellect, it’s a knockout combination. I highly recommend Geoff to the nth degree. 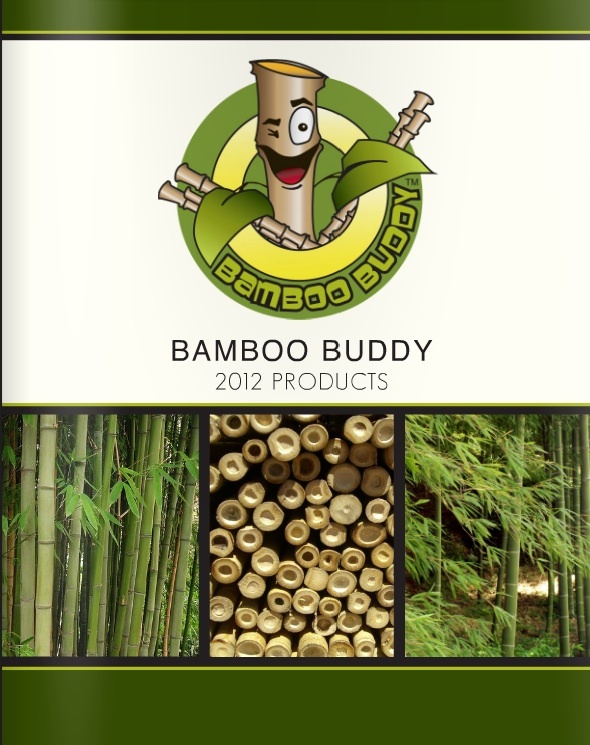 BambooBuddy, LLC. Oceanside, CA – COO 5/2008 – 01/2014 In charge of all operations for marketing and distributing products made from bamboo under various brands to Lowes Home Improvement Store, Home Depot, Amazon with pending Walmart deal for consumer products. Products include fencing, skateboards, dishware, sunglasses, and natural deodorizers. Directed $2.5M budget and a direct staff of 19 including Operations, Sales, and Warehouse Managers, as well as 5 independent sales representatives in the U.S. Results: built business from startup to multi-$million. Developed quality assurance program at factory and distribution level with less than .5% customer defect rate. Deployed Kaizen projects using Lean and Six Sigma techniques; cut warehouse labor expense by 7%, increased fill rate from 94.55 to 99.87, and raised employee productivity by 23%. 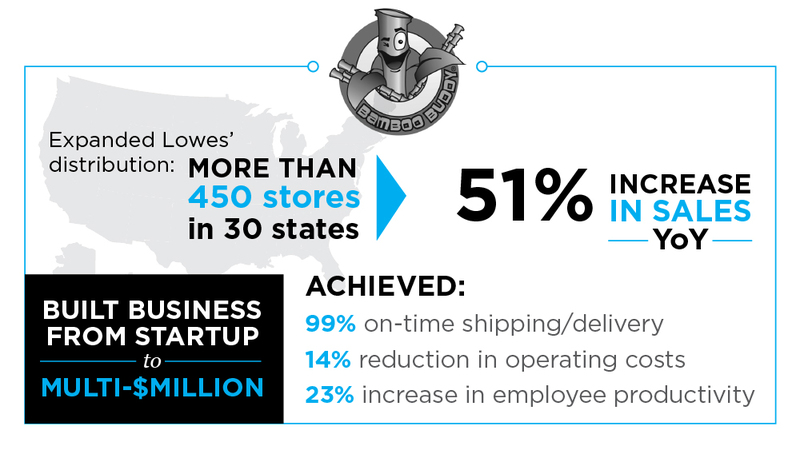 Increased sales 51% year-over-year by educating Lowes management in merchandising techniques. Expanded distribution through Lowes from 40 stores in 3 states to more than 450 stores in 30 states. Reached 99% on-time shipping and delivery gaining A-level rank from Lowes for inventory turns, quantity fill rates, quality returns and monthly sales as a vendor. Achieved 14% reduction in operating costs enabling investment in other brand pursuits without additional financing or loss of equity. Instituted process improvements resulting in consecutive annual 12% budget reduction. Cut and right-sized inventory, reducing by $102K and developed accurate JIT forecasting model. Geoff is an amazing asset to our corporation, he is also a great friend. I could NOT hope for a better business partner and co-owner in our company. His work ethic is second to none, his creativity is inspiring and his attention to detail impeccable. I highly recommend Geoff! P.S. Don’t let him catch you slacking. Geoff is a very astute individual with the company in mind. He is a very motivated individual who is capable of not only promoting direction in leadership but also ready to dive into any role when needed to assist. I recommend Geoff not only because of his strong work ethic but his attention to his peers. Geoff constantly challenged his employees to produce their best work. As an innovative and inspirational leader, he motivated me to turn in only the highest quality work. Another great skill I learned from Geoff is time management. Geoff excels in this area and he would drive my efficiency week to week so that I would manage my time more effectively. Ultimately, his dedication to the success of the company and his employees are second to none. As an accounting assistant at Bamboo Skateboards, I gained many meaningful insights into both the accounting profession and the business world thanks to the strong leadership of President Geoff Koboldt. As an international graduate-degree intern from China, I learned to organize my work properly, multi-task and manage my time efficiently, which enabled me to adapt to the American working environment quickly. This greatly prepared me for a smooth transition into an accounting career at Deloitte. I am confident Bamboo Skateboards has a promising future under the guidance of such a talented and hard working leader such as Geoff. Dark Horse Distribution, Inc., Marina Del Rey, CA – VP of Strategic Operations 9/2006 – 3/2008 Charged with turning around this struggling $4M+ action sports company that was operating at a loss. Directed production, finance, accounting, and strategy for this company with 13 employees. Managed $1.6M operating budget. Results: executed new business plan, reduced operating costs by $753K, established budget and financial accountability. Developed quality control process holding defects to less than .01% while increasing productivity by +15%. Reduced COGS by $740K and sourced new overseas factories for key products; negotiated with American vendors to reduce costs; savings freed up cash to pay off outstanding payables and invest into marketing and fresh branding efforts, including individual product updated logos, brand identity and new apparel line. Expanded Internet sales by more than 5,100%; orchestrated design and launch of 2 new Websites, including SEO, Adwords, and shopping cart with OS commerce. Reduced inventory costs by $50K and increased warehouse and office efficiency by applying 5S and lean techniques. Established new sales quotas, commission structures, and sales training. Milgard Manufacturing, Inc., owned by Masco Corp, Simi Valley, CA – Materials Manager 5/2005 – 8/2006 Directed purchasing of more than $41M inventory for this $120M window and door manufacturer with 400+ employees. Reported to Finance Manager and directed 32 staff and $1.1M budget. Instituted all lean practices for company. Results: saved total of $1.4M through reduction in GAP within 1 year, utilizing lean six sigma tools. 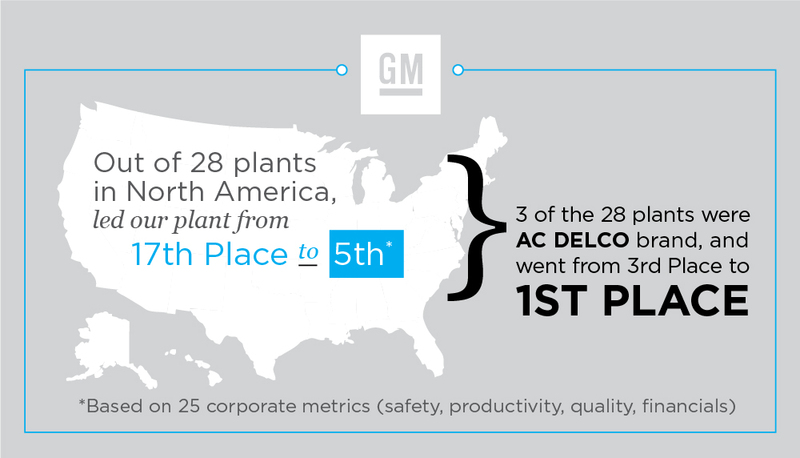 Recognized as #5 plant out of 18 for GAP, a rise from 11th place. Earned #1 materials management team. Increased productivity on aluminum line from .72 units/hour to .90. Gained $110K additional revenue by negotiating waste removal plan for broken glass and scrap aluminum. Reduced physical inventory write-offs by $203K; applied 5S to each production line and trained staff. Improved cycle count accuracy from 83% to 97.3%. I worked with Geoffrey Koboldt at Milgard Windows & Doors on many projects around operations and inventory controls. He is able to understand how his teams affect customer service and the bottom line to the company and how to manage those teams to provide a very high level of both. Geoffrey was able to grasp complex concepts very quickly and was always bringing new ideas and out of box thinking to the table. Continuous process improvement efforts were very evident throughout his facility in multiple departments and he was setting standards for other’s to emulate. Much of his success was his ability to bring cross functional teams together, identify roles, responsibilities and set clear goals. Geoffrey is a customer focused operations manager. He is skilled at logistic planning and inventory management. Geoff Koboldt is one of the most energetic people I have ever had the pleasure of working with. He has great ideas and is dedicated to his work. His desire to seek improvement in anything he does is inspirational and made me strive to be better in anything I do. General Motors Corp., AC Delco, Fontana, CA – Inventory Control Manager 1/2004 – 4/2005; Outbound Operations Manager & Quality Network Manager 6/2001 – 12/2003; Inbound Operations Manager 5/2000 – 5/2001 Managed 52 UAW and 8 salaried employees during tenure for this $250M after-market product division. Championed lean six sigma projects: area optimization, cycle throughput, slotting inventory, takt time, 5S, etc. Led quality improvements by 34% instituting a new process for quality assurance while ensuring productivity increases. Increased productivity 50% in outbound department from 28 lines per hour to 42 lines per hour and 15% for inbound. Earned #1 AC Delco plant and raised performance ranking to #5 out of 28 plants from 17th place, based on 25 metrics. Increased cycle count accuracy to over 99.5%, managing over 500+ skus. 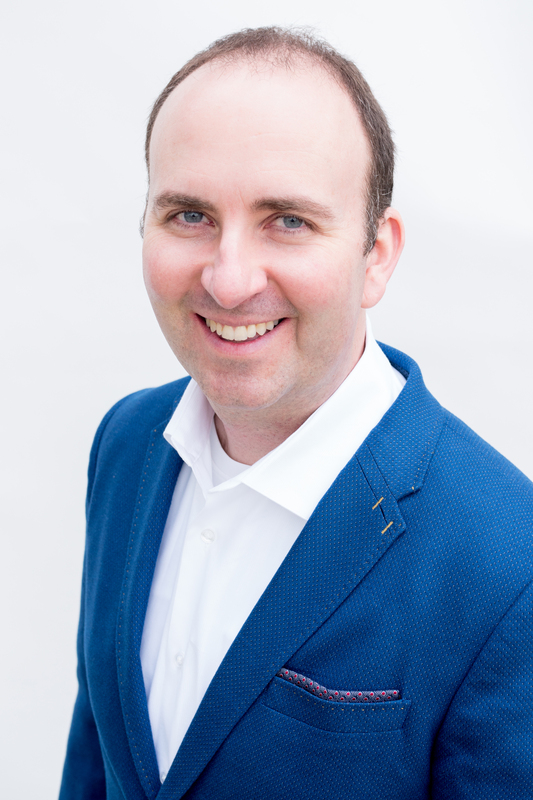 Geoff is an extremely talented leader who drove continuous improvement in all areas of the business through innovation, creativity, planning and execution. He was able to resolve complex problems and implement solutions through collaboration and superior leadership. Geoff was highly regarded by the workforce as well as upper management. His presentation skills are unmatched. I was extremely fortunate to have Geoff on my Leadership Team at the GM/SPO ACDelco Warehouse in Fontana, CA. I enjoyed working with Geoff. He is strategic and knows how to connect with all levels within an organization. He is very efficient and proactive in reaching his goals and he thinks outside the box when problem solving. Geoff, led many quality improvements and Kaizen projects with successful results. Geoff was a pleasure to work with. I was amazed at his ingenuity at handling complex situations with the Union. He came up with win win solutions and earned the respect of both parties in several situations. I whole-heartedly recommend Geoff. I met Geoff at the beginning of my career at General Motors. During that time I was able to capture a glimpse of what Geoff’s capabilities were and over the last 9 years I have witnessed his evolution and advancement in business. Geoff embodies and is a true “think outside of the box” professional. He is creative, resourceful, and resilient. It has been a pleasure to know him for all of these years as I hold a great deal of respect for him as a person, and as a professional.